As the cooler temperatures continue to take over most of the U.S., the game of basketball is heating up. Spring will be here soon enough, and with that arrival, the beginning of college basketball “March Madness” kicks into full gear. Fans and alumni from all over gather at bars, arenas, and their homes to watch their favorite players and alma maters compete for the National title. If you follow any professional leagues, you might have heard the TNT commentator and former NBA player, Shaquielle O’Neal, mention his catch phrase, “That’s barbecue chicken.” In fact, Shaq has been using that euphemism since he played in the early 2000’s to describe how he would “eat” (metaphorically speaking) his competition when playing against other NBA players. We encourage you to use the following ingredients to heighten your biggest fan’s taste buds. Outside the three or more pounds of chicken, preferably cut into eight pieces, we recommend using some salt, pepper, a little ketchup, some dark brown sugar, a little white wine vinegar, and some minced onions. Mix all of that in with your favorite Smoke Eaters BBQ and then base it generously. Since it might still be cold outside, when you’re wanting to cook this up, consider going the route of using the oven. Since you’re baking at 375 degrees, consider using the First Alarm or Second Alarm sauces with your mix. Go hotter if you’re going to forgo using the onions and pepper. Consider backing off if you’re adding seasonings that delivers flavor or spice. You might also want to consider marinating it overnight. Allow the cut-up chicken to sit in the sauce for roughly eight to ten hours before cooking. This allows the flavors to soak into both the meat and skin. It also allows you the opportunity to baste it a bit more before and during the baking process. Give yourself, your family, and your favorite fans a delicious meal while watching the madness take place all around you. A great time starts with great food. Great food starts with the right Smoke Eaters sauce. 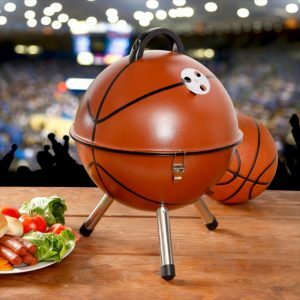 If you like the basketball grill we featured in this post, HERE is a link to purchase.